This winter I have been in southern Siberia, doing the last observations and interviews needed for my dissertation on multilingual Russian Buriat children. The primary research site of my work is located in Hohhot, Inner Mongolia, China, but several weeks ago I trekked to the Republic of Buriatia to make observations in the children’s homeland. A host family has kindly invited me to live with them in their apartment, allowing me access to observe their child at home and at school. But recently, my Buriat friend came to visit this family where I was installed as a guest, because my goal was to watch this child’s daily life at home and at school, as an additional final observation, per my dissertation chair’s suggestion. This child, a twelve year old Buriat girl, had left the bilingual school in Hohhot early because her parents missed her and called her home. By observing her here in Ulan Ude, I could further note the contrasts and differences in educational methodology, as well as language use at home and school and other aspects of communicative behavior. But now my best Buriat friend wanted me to leave Ulan Ude and go on an adventure. Initially, I did not want to go. 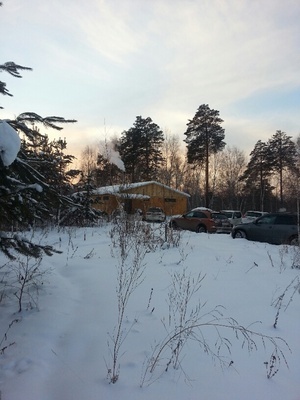 It was an aside to my work, it was minus 27C, and I was tired. But friends are important, she is my best friend on this side of the world, so I agreed. Every time Erzhena has suggested something over the eight years we have been together, has always turned out to be positive, interesting, and joyful. This time was no different. At ten that evening we boarded the train to Irkutsk, and settled down in the shabby but clean open train compartment, the first one, nearest the door. I slept with my Mongol coat over my torso, and a Russian wool blanket on top of that, waking up at six. The conductress told us we would arrive in an hour and offered tea. We pulled into the station and piled out into the crisp, frosty air (мороз) that enveloped the city. Zhargal negotiated with a local cab driver, a lumberjack looking Russian man, who was standing by a mini van rubbing his gloved hands to keep warm. He boomed out, rather crudely, that we should get in, he would take us, take us quickly, and not to despair or think twice. Erzhena smiled into her fur coat and whispered to me, “That’s the way they are here, it is not Ulan Ude ... the men, they talk like peasants, like cab drivers from Gogol, with their big bass voices, and they seem angry, even mean, but really, their hearts are large, as wide as the sky ... it is different here.” This man drove us to house number six, on the corner of Pioneer Street. We climbed out, the streets are slippery here, thick with ice and powered snow. Much snow had fallen over recent days, almost 40 centimeters of glistening white powder snow adorned the city, like frosting on gingerbread cake. The frost also floated through the still dark sky, I breathed it in, wonderingly, it was new to me, as Ulan Ude and Mongolia and Inner Mongolia are dry cold, not humid like Irkutsk. Zhargal’s son Amgalan met us in the street, carried his father’s bags, and took us to an apartment he had rented temporarily. “Come in, my American auntie! !” he said, embracing me in his bear hug, and then holding out his hands palms up, and greeting me with the Buriat New Year, by kissing my cheeks three times and saying: “Saagaalganaar, saagaan h’arrar (I congratulate you on the holiday of the White Month). We settled into this apartment, saying we were visiting just for two days; his mother immediately went to the kitchen and made us tea, with white cookies and white Mongolian uruum (cheese/milk fat). “But first, we must drink kusmiss (horse milk) said Amgalan, and he displayed with a flourish a bottle of this. We all shared the same cup, smacking our lips at the tangy taste, it was quite tasty, I thought. Then we ate the small breakfast, chatting about the internship Amgalan was doing as an alternative doctor of Mongolian/Tibetan medicine. “Let’s go there now, I have a client at nine this morning.” So we walked to his consulting chambers, which turned out to be in the basement of a flower & gift shop, ten minutes from his home. As we walked, Amgalan held my arm and talked. “You know, I was raised partly in Peter (St Petersburg); I love this city and will settle there with my (Russian) wife, eventually. I know mama doesn’t like it, it is a Russian city, like Irkutsk - but the architecture, the beauty, it pleases me, I don’t want to live in the sticks of UB (Ulan Baataar) much longer. Here there is more to do, better food, clients who can pay more...life is this way.” As we walked, I agreed that the building were indeed lovely, and contrasted with UU and UB...would I, if I were young, head for a large city? I certainly had no love for Beijing, or any large Chinese city, and my home city, Santa Fe, was small but elegant. The largest city that appealed to me in my middle age was Montreal. Amgalan is almost finished with his medical studies. He has been studying for many years, he started in UB, in a Buddhist university for two years, then he moved to Hohhot, Inner Mongolia, to begin at the medical institute (which is the goal of my focal children’s parents) for five years. Currently, he is doing his last studies again in UB, and this includes various internships on his own as a healer/doctor in training. He will be here in Irkutsk less than a month, practicing his art. He spends his time receiving clients, or running to the the Medical Academy of Science to meet one of his committee members, and cooperating with various medical people in obtaining medical herbs from China to various other doctors and interns. Amgalan has already made a name for himself; people come from Ulan Ude and all over Irkutsk, some come from St Petersburg, to receive his medicine, massage, acupuncture, and advice. A family friend, a wealthy Buriat from Ulan Ude, for example, entered the waiting room after we had settled there and were wrapping medical powders for him. After her treatment, she invited us to an elegant cafe and we ate a huge Englishman’s breakfast, complete with beans, toast, sausages, eggs, and coffee. Stuffed, we waddled back to the office, where yet another Buriat friend was waiting for us. Igor, a 36 year old Buriat, descended from a Russian mother and a Buriat father, greeted us and promised to meet with us again during the holiday; he had just come to say hello. Another man, a huge Russian man, over six feet and muscular, who seemed about fifty, with cropped gray hair, gray eyes, and stern expression, entered. “That’s Dmitry, he is a shaman, and he will drive us to the shaman’s gathering,” whispered Erzhena. The men talked as we, the women, sat quietly and waited. After some time, we exited the building and got into a new Range Rover, and headed out for the gathering. In the back seat, Erzhena chatted with me. “Last year, Zhargal’s brother died, then his father died, too...his mother has already long passed away, so he has only two younger brothers...you know them, but the one who takes care of his herds, he has a large family, he cannot be a shaman; the other is in Mongolia, trading at times...Zhargal went to see a shaman he had met and was impressed with...he was depressed after his brother and father passed, and this man told him he HAD to become a shaman, someone was needed to defend the family. He was also struggling financially; his trading business (Baikal jade) had floundered; his trading of timber was encountering difficulties, and his younger son had broken the law in China, causing much grief. During the six hour visit, I watched as Zhargal met with his mentor, and like the other acolytes and shamans, he constructed a pyramid structure of cookies and sweets, to offer to his ancestors, pray over, and then take out into the snow and hurl to the spirits. 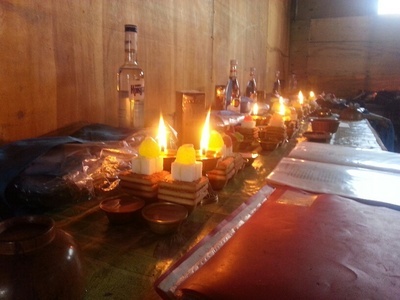 (picture)The shamans and acolytes also visited each others shrines (picture), bowing three time and holding their fingers to their eye sockets as they bowed and prayed. This process repeated several times. At times the shamans would change clothes, take a break, and go out into the snowy wilderness to chat and smoke like regular men; the women, in contrast, changed their clothes and often went into a side room, where they seemed to be taking turns at making pirogs, (fried meat pies) buttering bread, and making tea - These foods were offered freely to anyone who walked in, without charge. Like Erzhena and I, some of the visitors were a shaman’s family members, or simply curious onlookers. I asked several people if I could take pictures, and all answered, “Why not?” (But to be discreet I took only a few pictures and only a few minutes of sound recording). Two things of significance caught my attention. 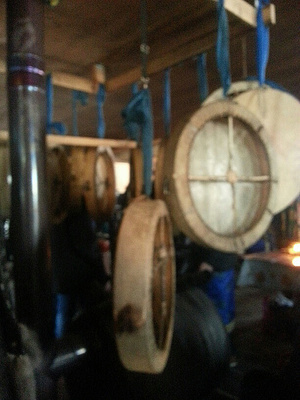 First, toward the end of the day, a group of three shamans, all Russians, beat their drums together. They seemed to be really getting into it, like a rock band that goes into the beat, and people stopped eating and milling about; we gathered to watch. 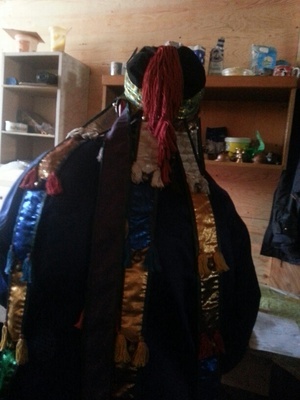 Then the three stopped drumming, and one man placed upon another man a huge headdress, this was the dress of the ongon: the spirit of the ancestors. This man sat on a stool, hunched, with shamanic stick in his right hand. People lined up, crawling on their knees in front of him; he could not see them, but he would heal them. This he did either by beating them one or more times on their backs; once or twice he gave a resounding thump, or he would take a head in his hand (sometimes one hand, sometimes both hands) and massage the head. Sometimes he did nothing for several minutes; sometimes he thumped someone immediately. Fifty two people received this healing; then a fellow shaman stood in front to stop the line, and removed the headdress. 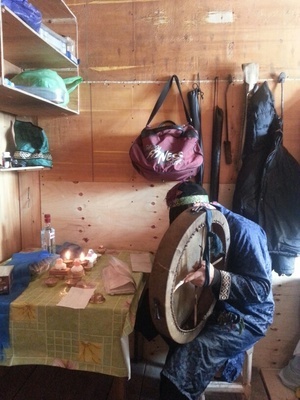 The shaman, a Russian man in his 50s, appeared to be in a trance and very weak. A fellow shaman revived him with incense burning in a small iron frying pan. This process took several minutes, with the shaman unable to open his eyes; he swayed, as if he were to fall. Finally, he blinked and gasped and came back into this world. Then he got up, and nonchalantly walked out of the building to get some fresh air. A little bit after this healing ceremony, Zhargal grabbed me and said: “You may ask a question or two of the great shaman Aartuuro. 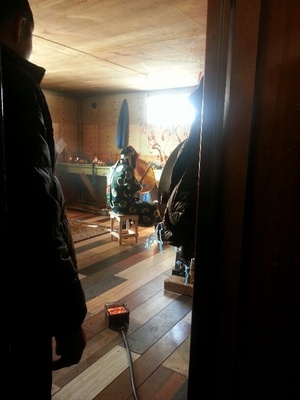 I was hesitant, but he pushed me into a small room, where this shaman sat on a wooden seat, almost like a throne. In the room was a tree, with strips of red and blue cloth tied to it - prayers and wishes. There was also a pile of bones, and several shrines, that had been used earlier by other shamans. People were standing, hats and gloves off, respectfully, waiting for their turn to ask a question, or simply to listen to what the master shaman would say. “What is you nationalisti (ethnicity)?” he asked me. “I am American,” I replied. “No, I am asking your nationalisti,” he repeated. “No, you are not,” he repeated. “Ohh, yes, I see - my mother was a Finn, I am half Finn,” I said. Shocked, I nodded, as the Fulbright for Sept 2014 was still in process but presumably I am set to go to the Altai. I agreed and thanked him politely. “She has another question, a personal question,” said Erzhena to the shaman. “Ask, ask,” he said, his brown eyes sparkling at me. “You have no children?” he said, eyeing me. “And your husband died of cancer, actually leukemia from complications in the cure? I was stunned. In middle age and still working on my disertation - I should adopt a child? And how did he see how my father had died? How my blood was not “American” ? Shamans are certainly powerful here. What a wonderful Shamanic Journey and Tale of cultural and climatic complexities and bonds. Thank you for taking us along with you on this part of it. And good luck with your diesertation !